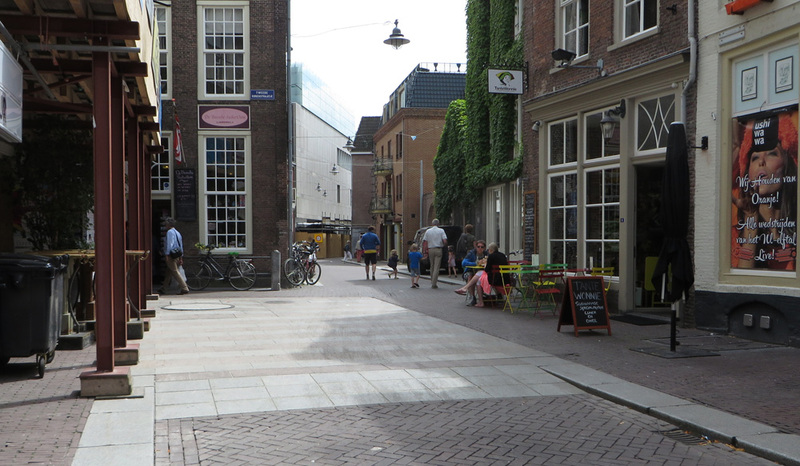 People walking and cycling dominate Visstraat in the historic city centre of ʼs-Hertogenbosch. Until the late 1990s this was an ordinary street designed for motor traffic, but since then it has become one of the very few examples of ‘Shared Space’ in the Netherlands (that I know of) that does seem to work. 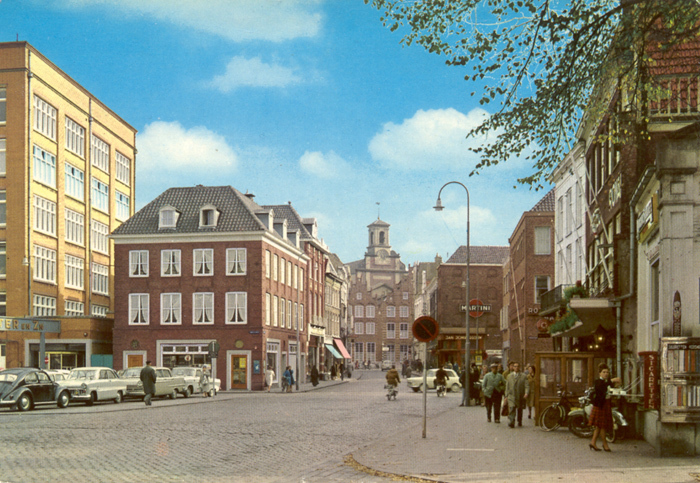 Visstraat in the late 1960s when it was still designed with ordinary carriageways and all the streets could still be used by through traffic. Note the parking lot. The big yellow building was a factory for grocery products. The same location looks very different in 2014. All road users share the same space but motor traffic is restricted and low in volume. The grocery product factory has been replaced with an apartment building. The same goes for the church in the distance. For some streets Beth Gali’s designs worked out perfectly. Vughterstraat is an award-winning example (Omgevingsarchitectuurprijs 1998). But not everything worked out so well. In a sloping street she designed steps and that was highly criticized and reversed rather quickly. A lot of people cycled in this street, which was made impossible by the steps. The different type of weather in the Netherlands was also something this Spanish architect did not take into account enough. The expensive natural stone she used on some locations became too slippery in the Dutch rain and had to be replaced as well, because people cycling slipped on it and fell. On other locations the expensive paving material could not withstand the heavy motorised vehicles and many of the stones broke. Typical for her designs is that she seems to deliberately deviate from the road design recommendations. Two streets that don’t align were designed in such a way that the carriageways also don’t align. Both carriageways simply end in an area without any markings and the road users have to figure out how they go through the area. Two streets that don’t align. So the carriageways simply stop in a “Mini-Shared-Space-zone” and all road users have to negotiate their way through that space. Not how a traffic engineer would do it, but an architect clearly would. Visstraat was also designed that way. All the streets leading to it simply stop and end in a square with a surface of grey blocks of natural stone. There are no height differences nor a clearly marked pedestrian area or carriageway. It is fortunate that this street/square can be found at the edge of the pedestrianized area of the city centre, because there is not much motor traffic as a consequence. There used to be a public parking garage that attracted a lot of traffic, but that lost its public function and is now only used by residents. On the other hand there is a bus line that traverses the square (in one direction) and residents can drive here if they have too. But the main flow of traffic is that of pedestrians and people cycling. 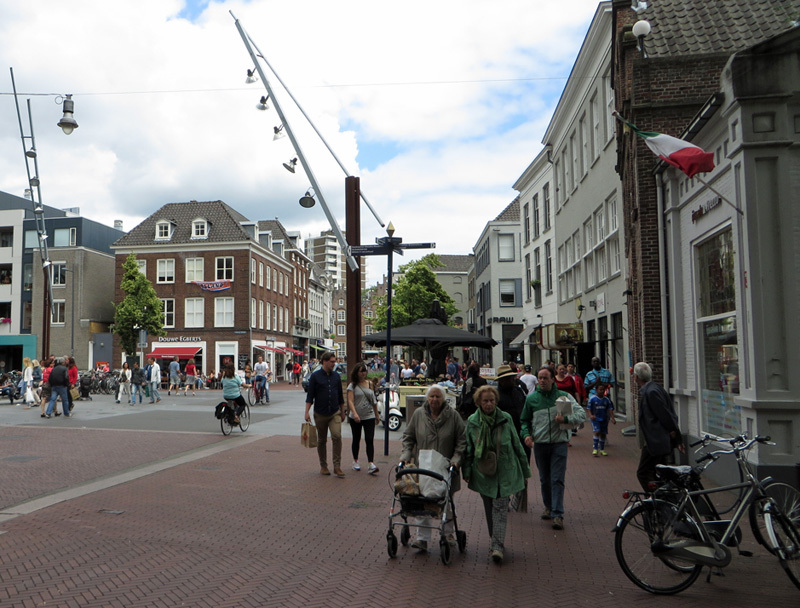 The pseudo Shared Space square in Visstraat. Most streets leading to it are one way or even pedestrianized. 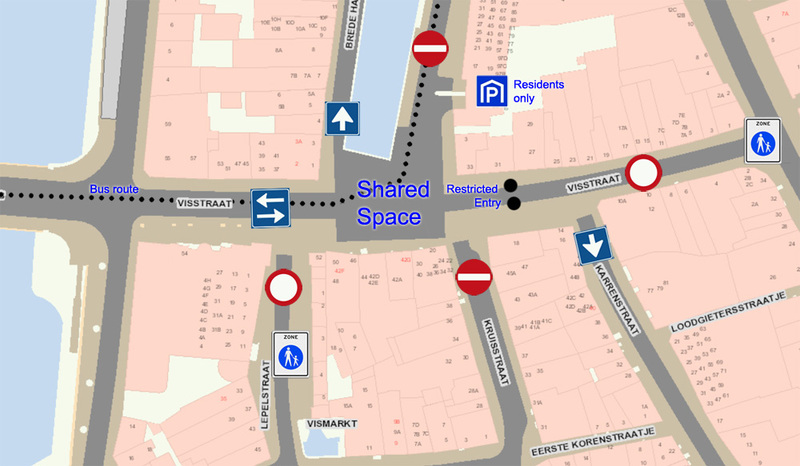 Visstraat to the east is for residents only (they need an electronic pass to operate retracting bollards). The bus route is represented by the dotted line. Given her other designs I do not believe architect Beth Gali designed this square with “Shared Space” as it is known now in mind. But it has almost turned out that way. This is within a 30km/h zone, so there are no signs for priority. (In a 30km/h zone the default priority deriving from the law is always in force.) The only signs you find are the ones indicating how the one way streets are arranged. There is no clear division between pedestrian space and the space for other traffic (although a few brass ‘dots’ do give a hint). There is one outside seating area that has a few big stone blocks and planters to stop traffic from coming too close as well, but that is about it. Traffic does however come from ‘normally’ designed streets and goes to such streets as well. So even though the markings and kerbs (curbs) are missing on the square itself, traffic naturally follows the invisible lines connecting the streets on either end of it. 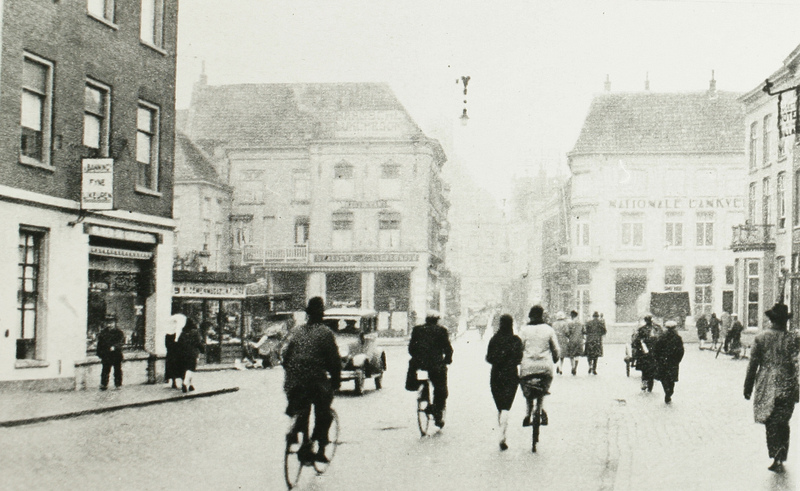 The area that is now shared was also dominated by people waling and cycling in 1928. But there was an ordinary carriageway at the time. The main reason why sharing the space by the different types of traffic works on this location is the sheer number of people walking and cycling. Their number is far greater than the few cars and buses that pass here. In fact there are almost 10 times more people cycling than there are motor vehicles. And when you combine walking and cycling there are almost 23 people walking and cycling for every car that passes here in the 6 minutes that I have filmed (on a Friday afternoon in early rush hour). This is immediately reflected in the behaviour of that motor traffic. Motorists generally adapt their speed to the pedestrians and they traverse the square really in walking pace. It also helps that only traffic that has to be here uses this street. Motorists usually live in the area and are therefore very familiar with this place. Even the frequent buses blend in nicely. The accidents website does not report any incident at this particular location between 2007 and 2012. 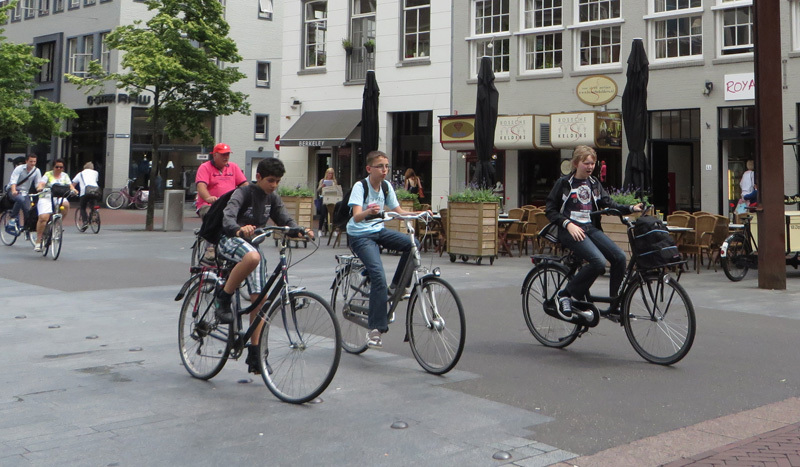 School children cycling in the pseudo Shared Space zone of Visstraat in ʼs-Hertogenbosch. Note that even though the volume of motor traffic is low, the expensive grey blocks of natural stone were broken by the heavy motor vehicles in such high numbers that continuously replacing them became too expensive. The city now started to patch the area with ordinary black asphalt, while contemplating a more permanent solution. The only time the system works less than optimal is when motorists think they can park their cars to do a quick errand (this happens in the long version of the video towards the end). They then almost always block one of the flows of traffic and especially the turning buses need a lot of the space. When there is a blockage people cycling start to flow in all directions, almost like water under pressure. Shared Space is overrated outside the Netherlands. And seems to be misinterpreted in the United Kingdom especially, where experiments are being undertaken in streets which are completely unfit for Shared Space, like London’s Exhibition Road*. In the Netherlands Shared Space is a local experiment that did not catch on in the rest of the country. Most locations are in the far north of the Netherlands. Shared Space is certainly not recommended when there is a lot of motor traffic, especially not when motorists aren’t used to adapt their behaviour to people walking and cycling. But there are always exceptions… here it works and seeing how it works is quite entertaining, I think. Visstraat, ʼs-Hertogenbosch on Friday 6th June from 4:03 pm to 4:09 pm. That little boy cycling in the still is wearing a superman outfit! The camera sat on this bench in the foreground in Visstraat in ʼs-Hertogenbosch. See this location in Google StreetView. Whenever I publish a video like this, there are always people who mention they would like it to last longer. Especially for these people there is a longer version. That video is 20 minutes and includes the first 6 shown in the video above. * After I had lined up this post, Mark Treasure published his poignant Poynton example of Shared Space gone horribly wrong in the UK (especially wrong for cycling). The traffic volumes are telling. In Poynton 26,000 motor vehicles per day pass the square that is designed as Shared Space. Those numbers are completely unacceptable for Shared Space. The Crow Manual in the Netherlands advises separated cycling infrastructure when there are more than 5,000 motor vehicles per day on a certain street. To give a bit of perspective, there are places in the Netherlands that see 25,000 vehicles per day, but the Dutch chose very different solutions for cycling at such locations. This is just one example! What’s happened to the building with the beautiful bell-tower in the 1960s photo. What a shame it’s been demolished! 1) pedestrians and cyclists sharing – eg footpaths in parks or similar, or pavements where cyclists are permitted. 2) pedestrians, cyclists and drivers sharing – in the rare locations like Exhibition Road and Poynton, where people like Martin Cassini have this odd utopian view that everyone is somehow equal there are no traffic lights (?). Notably cyclists and drivers sharing is not generally called shared space, because it’s the default here – bikes on roads – so it doesn’t need a term to describe it, although of course it’s just as shared as (1). So the whole shared space debate gets a bit confused. Seems to me that the equality comes from having similar sizes (weights), and similar levels of manoeuvrability and speed. If these criteria are met then modes can reasonably share. Slight mismatches are acceptable if they can be minimised and traffic levels are low. In the video above cyclists and drivers seem to be at similar (relatively low speeds). Motor vehicles are restricted to one-way traffic and as far as I can tell, even considering the low speeds, pedestrians are staying well out of the carriageway – it looks like a carriageway to me despite the infrastructure doing its best to downplay that impression. It’s marked with dots on the map and dots on the ground itself (and street furniture on the far side), plus it’s a very short section meeting up with more clearly marked carriageways on either side.. If all modes were genuinely equal then surely there would be no need for the brass dots, but I think without them things could be messier, as they would if drivers routinely crossed that line. There’s a clear “road” and a clear “pavement” here despite the lack of kerbs. 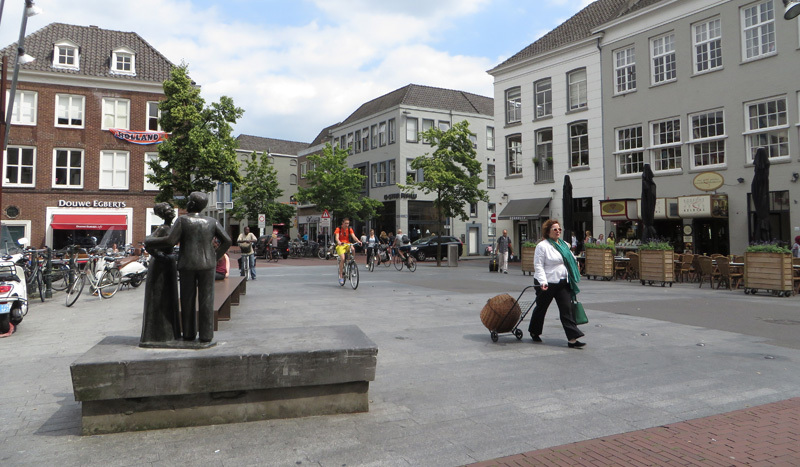 This entry was posted on 19 June 2014 by Bicycle Dutch in Original posts and tagged ’s-Hertogenbosch (Den Bosch), shared space, watching people cycling.